New Spill Containment Berm, Your Protection in Case of a Railcar Spill. Are you in the railway industry loading and moving rail cars or a company that has chemicals delivered by rail? Leaks or spills contaminate the soil and lead to environmental damage and costly cleanup. Apart from chemical contamination, a railroad spill can also be a fire hazard. Compared to pipelines, crude oil spills from trains can be bigger and worse. Such incidents may result in serious fatality like fires and explosions. Regulations require a spill containment system to be implemented in railway facilities to prevent these risks from happening. The Railroad Track Berm can capture up to 144 gallons of a tank car leakage. A larger spill is no problem. The berm has camlock fittings that can be attached with drain hoses to direct the larger spill to a waste collection area or larger container. With proper planning you can control any size spill if it happens. Our Railroad Track Berm should be in place when loading areas are busy loading and unloading tankers or chemicals from box cars. Unlike track pans, this rail spill containment unit is easily moved from railcar to railcar as the work is being done. One person can easily move the berm since it only weighs 24 pounds. The track berm is made of heavy-duty 42 mil PVC material. Dimensions are 72 inches x 48 inches. Wall height is 12 inches. Walls are made of closed cell polyethylene foam. See Technical Information below for a link to chemicals that are compatible. The Advantages Over Other Spill Containment Products? 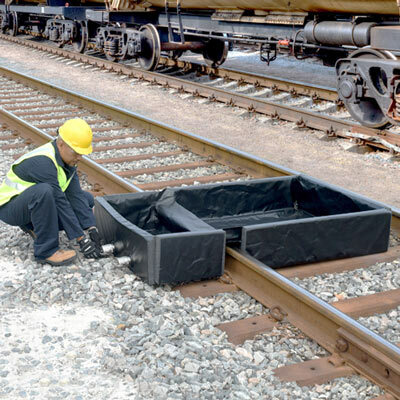 The Railroad Track Berm is made of durable, lightweight material, making it easy to carry between railroad sites and easy to place under leaking railcars. The berm has a dual-sump design which provides protection from both sides of the rail. Railcar track pan systems with center pans take days to install. Railcar track pan systems are not portable like the track berm. Both camlock fittings are made of stainless steel. It allows fast and secured drainage of liquid flow, making it effective for spill control. The foam walls are made of closed-cell polyethylene. The 40 oz. (42 mil) PVC constructs makes the berm durable. It is highly compatible with most chemicals and is able to withstand harsh conditions. If you want top quality spill containment products, we are your best choice. We help businesses to comply with federal and local regulations involving oil spills, spill response, facility protection, stormwater management and more. Our goal is to help you meet EPA Container Storage Regulations and SPCC requirements. Our spill containment product line is the most extensive in the world. These secondary containment products are versatile in terms of compatibility with different chemicals and a wide variety of vessels. The containment track berm model is engineered for the environment and for your budget. There is no other brand in the market that guarantees 100% client satisfaction. There is a large selection of products available in the market that you can choose from. The question is -- which is the right one for you? PCI products has been in the B2B business since 1985. Our goal is to help our clients select the right brand for their business. Our ordering is fast and convenient. With decades of selling products on the internet, take advantage of our expertise in helping you comply. Our services are tailored to your needs. Please feel free to reach us via phone or email to discuss what kind of problem your business is currently facing and may experience in the future. We are ready to assist you in finding the right solution. The Railroad Track Berm is the right product for you if you load or unload fluids from railcars. It's durable and easy to use. 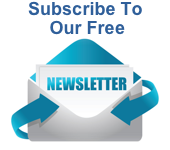 Helps you meet federal and local regulation requirements for the safety of your site and workers. Buy your portable railroad spill containment today. Call or email us so we can process the details of your order and arrange shipping. Helps with Federal and local regulations that are required to meet spill containment standards. Engineered to fulfill EPA and SPCC requirements. The track berm is portable and easy to carry to from one spill site to another. Unlike railroad track pans that can require days to install or move. Albeit lightweight, it is made of industrial-strength material which can withstand severe conditions. Larger spills no problem. 2 camlock fittings included to drain spilled material to spill collectors. Don’t forget to order absorbents and spill kits to use with your Railroad Track Berm. Railroad Track Berm – Dimensions: Outside 72 inches x 48 inches. Inside 67.5 inches x 43.5 inches. Wall height 12 inches. 42 Mil PVC Capacity 144 gallons. Weight 24 lbs.